This entry was posted in acceptance, connection, diversity, humanity, relationships on 3 June 2018 by Martina. Life is not “one size fits all.” It never has been, and never will be… thankfully. Our health, our bodies, our faith (to name a few) – they’re all beautifully individual and unique, as they were meant to be, despite Madison Avenue’s best efforts to convince us otherwise. Where we have found overlap and commonality, we have created fellowship or community. 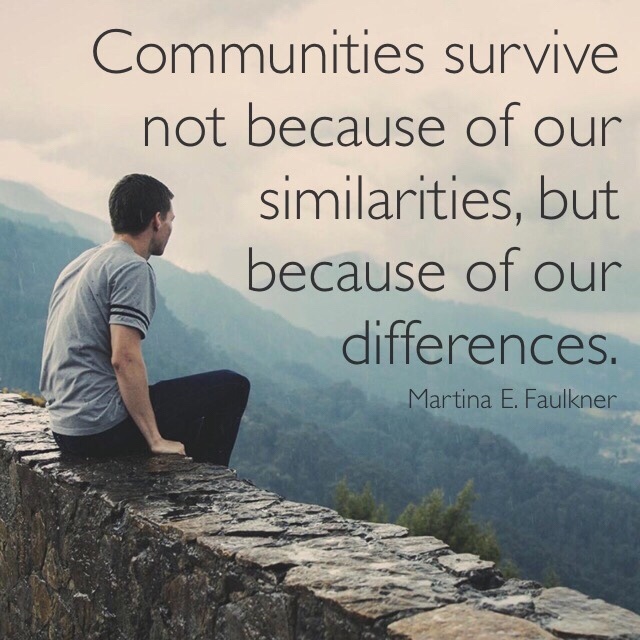 But those communities survive (and thrive) not because of our similarities, but because of our differences. We strive for “normal” because it’s what we’re told we should be. Normal height and weight, normal mental health, normal eating habits, normal exercise routine, normal grades (which, interestingly, translates to “above average”). But what if you don’t fit into the “normal” categories you’re inundated with on a daily basis (and most of us don’t, in one way or another)? What if your genetics, DNA, pant size, skin type, or blood type don’t follow the guidelines for “normal?” What do you do then? Well, if you buy into the paradigm of “normal” or “one size fits all” thinking, you begin to bend over backwards to become anything that fits the mold. Unfortunately. Because humanity is anything but “one size.” It’s not meant to be. Just like no tigers have the exact same stripes, humans are meant to be as diverse as possible, with as many expressions and combinations we can have. We’re meant to flourish and grow, ever-expanding… exponentially. In fact, the only “normal” thing about being human is being unique. Being uniquely you is what creates the diversity that allows communities to thrive. If everyone were a doctor, we’d fail. If everyone were a teacher, an artist, a banker – we’d fail. We need each person to be who they are… to be the cog in the wheel they are meant to be, and there’s nothing “normal” or “one-size-fits-all” about that. Being unique is healthy, striving for sameness is not. More importantly, it’s the very nature of the Universe to be expansive, to continually be changing and growing. (Look at evolution!) So, to subscribe to a notion that promotes sameness is to go against the very nature of our being, and makes life so much harder. And who wants that? Yuk! The connections we create in our overlap is what makes the journey more rewarding. When you find someone who loves the same things you do, you celebrate and form a bond. Hooray!But it’s the differences we get to experience in one another that actually makes us human. This entry was posted in authenticity, connection, gratitude, relationships on 9 January 2018 by Martina. I was sitting in a coffee shop the other day waiting to meet someone, and I overheard the conversation going on next to me. It was two women talking about another woman, who had yet to join them. They weren’t saying anything particularly harsh, but not particularly nice either. When their missing friend showed up, and one of the first two women excused herself to the restroom, the conversation turned. Now the remaining two were discussing the new absentee. Again, not particularly cruelly, but not lovingly either. I felt genuinely sorry for all three women. As I sat there waiting for my meeting, I found myself lamenting the fact that even the “safe” places we create are not as safe as we might think. 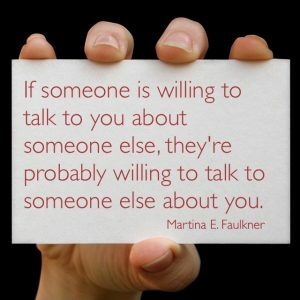 And then I thought about gossiping in general and how it seems if someone is willing to talk to you about someone else, they’re probably willing to talk to someone else about you. Well, I think the answer is simple, yet twofold: 1) we want connection, and 2) we want to know that we, ourselves, matter. We want connection. This is a simple human need. 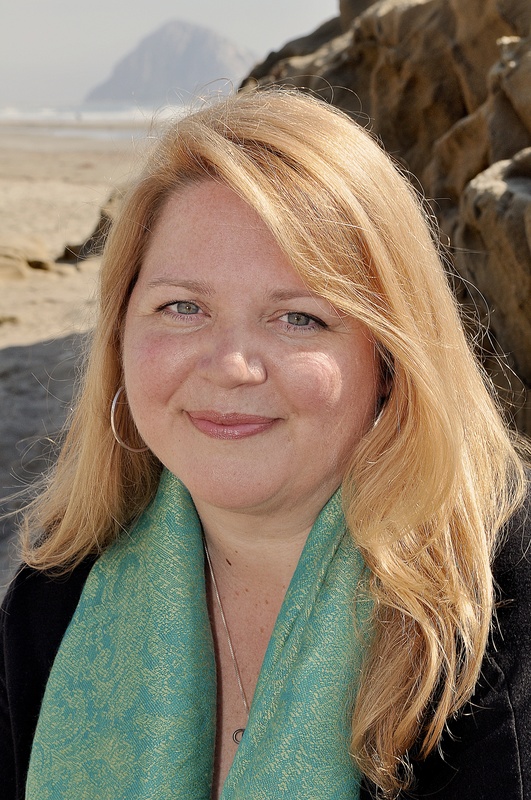 Brené Brown’s research has suggested that it’s a hardwired (biological) component of being human, much like dogs are hardwired to live in packs, or deer in herds. We’re wired that way. And, in lieu of making positive connection, we’ll take anything we can get – even if it involves disparaging another human in the tribe. I think it’s that last sentence that gets me. We are willing to “disparage another human in the tribe” in favor of our own self connecting. This puts the individual ahead of the group. Which is somewhat antithetical to our tribal hardwired nature. Which brings me to point #2: We want to know that we matter. i think we have gotten so disconnected from each other (for SO many reasons I can get into at another time), that we have begun to feel like we don’t matter. Like our lives are not valid. And the way to find validity in a situation like that is to create a hierarchy of worth. Hence, we put people down, in order to connect ourselves up – to belong “more” to the tribe than the other person. Sadly, this is cyclical and feeds on itself. So, how do we break the cycle? We create deliberate and intentional connection in communities, fellowship, or tribes that share our common values. We seek out connection without hierarchy or measurements of worth. And, perhaps most importantly, we learn to value ourselves enough to not feel the need to put anyone else down and gain some sort of temporary balm from disparaging another. This is not easy work, but it’s doable. I know, because I have done it. I’m not perfect. I have certainly joined in on my fair share of gossip over the years, but over the years it has decreased more and more as I have become more aware of how it made me actually feel inside (aka: awful). Years ago, my tolerance for gossip increased like an addiction until I was living almost entirely outside of myself, relying on anecdotal stories from my external world… and I almost died. My spirit almost died, and, frankly, my body probably wasn’t far behind. While the externalizing (gossiping) has pretty much ceased, my life is still a work in progress as I am still slowly cultivating my tribe, or my community, and that’s ok. I’ve learned to love my own company more than anything, so I rarely feel lonely – which means I rarely feel the need to gossip or disparage another in order to feel worth. It’s quite amazing, really. And the conversation I was unintentionally privy to last week was a beautiful reminder. It reminded me of how wonderful it can feel to love oneself, because it means many of my self-loathing-fueled externalized behaviors have been replaced. Thankfully. #metoo … but “boys will be boys,” right?! Wrong. This entry was posted in awareness, Blame, change, compassion, connection, rationalization on 20 October 2017 by Martina. I’m frustrated… as you can see by something I just shared on FB. 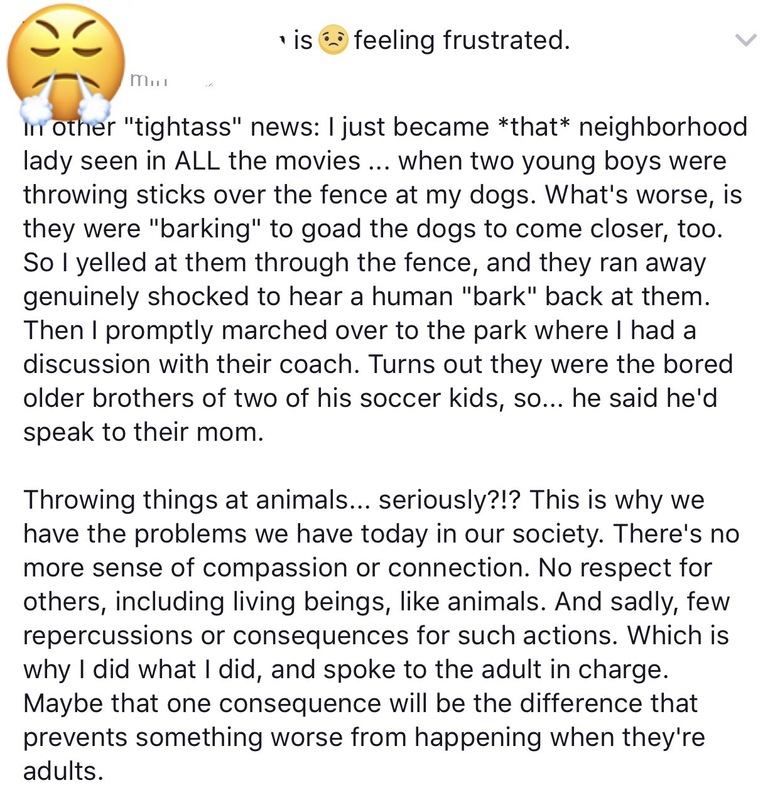 Why would anyone think it’s ok to throw things at animals, let alone goad them into coming closer?!? I know if you ask *most* humans, they would find this behavior wrong and even alarming. It’s this type of behavior, where many might say “boys will be boys” in response. But what if it’s EXACTLY this behavior that later leads to assault. I don’t see a difference in assaulting a defenseless animal at 8, and assaulting a woman years later. Maybe, in fact, they’re inextricably linked. Maybe if we didn’t allow this behavior in our “boys” we wouldn’t have an epidemic of it in our men. Maybe if we held our kids accountable for their actions and instilled in them a sense of compassion, respect, and kindness, we could turn this thing around in a single generation. Maybe. I did my part today. I held them accountable. I hope it redirects their ship. It takes a village… together, we can change this.